Here’s the video tutorial. You can follow step by step below too. When you’ve downloaded the free files, print the box top, box bottom, enough cards and tabs on a sturdier sheets of paper (I used 160g/m2 paper, that’s about 59 LB Cover) or on the back of some beautiful scrapbooking paper. I’ve used a page from our Tea Time Papers (CARD) for the box. Cut out all the cards, dividers, box top and box bottom. The cards and tabs go faster if you use a paper trimmer. For the box parts it’s better to use scissors. Score all the folding lines of both box parts. Fold every part. I like to go in there with a bone folder for some extra crispy folds. Put glue on the outside (printed side) of all four small tabs. Then glue each tab to the inside of its neighboring panel when you close the box. Put glue on each top flap and fold them inwards to make the box extra sturdy. Press the flaps extra with your fingers or a bone folder, especially in the corners. One part is ready, make the other part exactly the same way. The top is just a bit larger than the bottom, so when you close the box, it fits like a glove. The tabs are for the rooms in your house, the cards for all storage units. Write all the rooms / spaces you have in your house on the tabs, like “Sarah’s Bedroom” / Kitchen / Laundry Room / Garage etcetera. Also make a ”Done” Tab. Write all the storage spaces, as detailed as you like, to the cards: “Cupboard by the door”, “Chest of drawers – Drawer 1” – “Book Case – Shelve 3” etc. Put all the tabs in the box and sort all the cards behind the right room tab. Put the “Done!” tab last. By the way, if you like to add text with your computer before printing, click here how to do that. This will only work on the JPG files, so that’s why I included them in the downloads. Now when you start cleaning or decluttering, take the card of the place you would like to tackle. When cleaned or decluttered, just put the card behind the “Done!” tab. Repeat until every card is done (in your own pace, this can happen over the course of weeks). If you keep this up, your house will enjoy a regular cleaning and decluttering routine and give you that feel-good feeling of accomplishment. We also have a beautifully decorated version of this box and tabs in our shop with blank and ready made tabs. 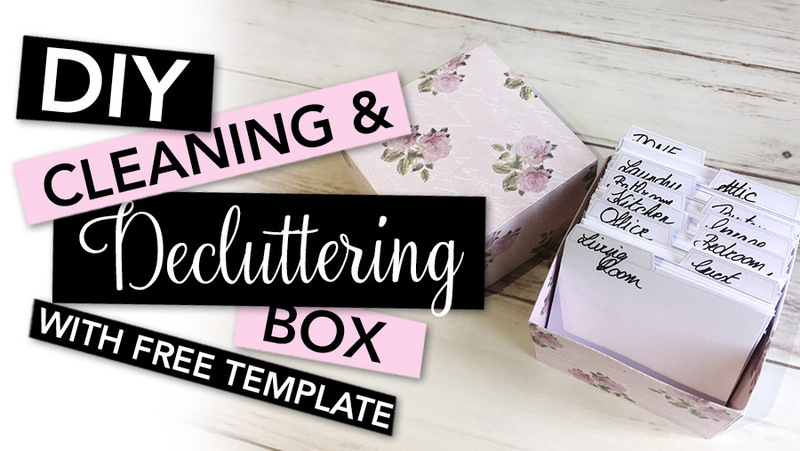 I hope this tutorial will be super helpful to you to keep up a clean, clutter-free and organized house. Once you’ve put your cards behind the “Done” tab, how do you know where/when to reposition them for each room? Indeed, good thinking! I’d write the room on the back of the card, or a little ‘room code’ in the corner.